Improve the discoloration of your teeth! Commonly seen tooth discolorations are a result of tetracycline staining, smoking, dietary habits, excess floridation, decay or trauma. Depending on the cause of the discoloration, the discoloration can be improved with enamel microabrasion, bleaching, veneers or crowns. Since smiles are an important reflection of our personality, we find even the slightest discolorations on teeth objectionable. The solutions to reducing most spots, discolorations and deformities are relatively simple. 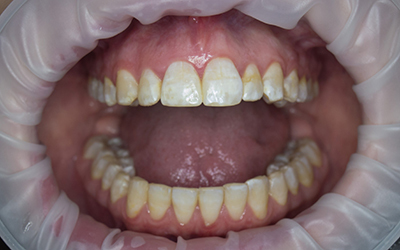 Enamel microabrasion is a simple procedure that removes surface level discolorations and stains. However, some discolorations deep within the structure of the tooth involve the more extensive restorative options like veneers and crowns. With enamel microabrasion on teeth, the affected areas can be cleaned with a mild acid to remove the discolorations in the tooth. Once the discoloration is reduced, the tooth is prepared and restored to match the color and shape of the remaining tooth. These restorations when finished and polished are esthetically indistinguishable from the remaining teeth. Enamel microabrasion is a simple, cost effective remedy to restoring a patient’s smile and self esteem especially when discoloration is in the smile zone.